Three-quarters of the Kiwi Challenge. Today is 11th day to show off the knife skill. 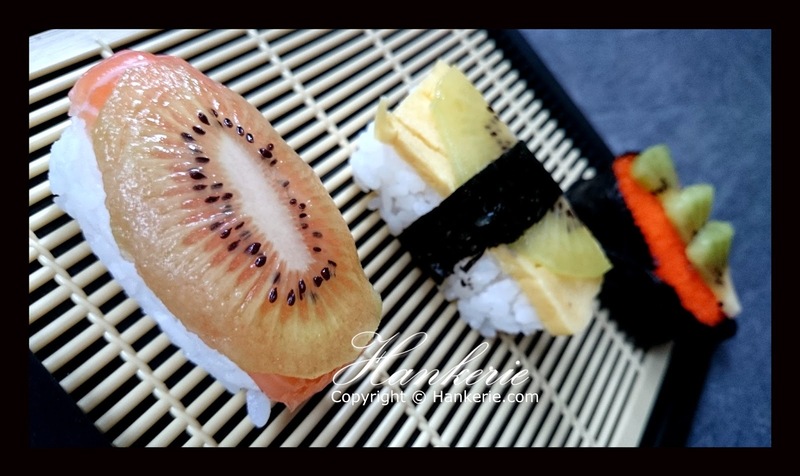 To me, the most difficult part to showcase how good is your knife skill is cutting the fragile kiwifruits onto sushi, it must be even thinner than a sashimi. 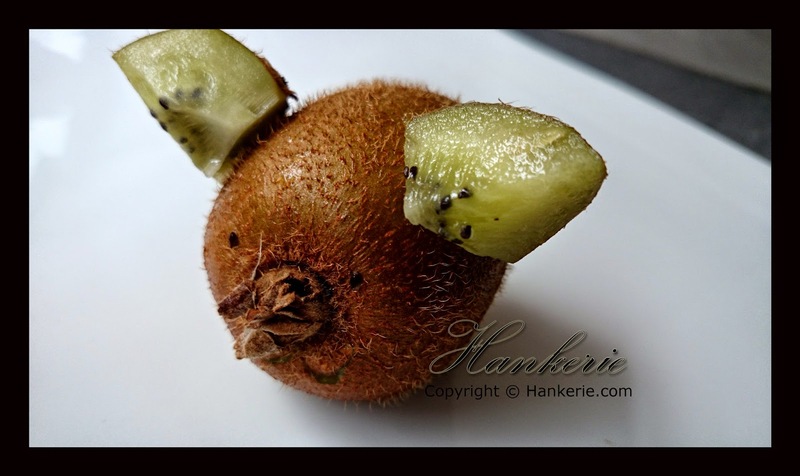 Follow on from my previous post on Kiwi Frankenstein, I've some more new idea in making this little brown hairy fruits into cutie animal. I myself also not too sure what am I trying to do, just thinking of something looks cute. Started to test my knife skill since last week, by cutting plenty of times on the kiwifruits, from cutting into cubes, slices, modelling kiwifruits into cutie animal. Gosh, I have cut more than 22 green kiwifruits since last week. 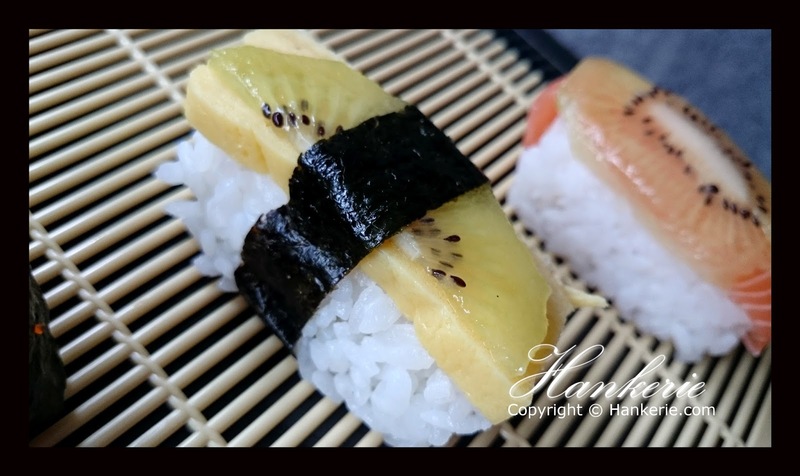 Today, finally make these homemade kiwi sushi with the combination of sashimi, omelette and tobiko. This is my 2nd time in making sushi at home, after my first time making sushi in New Zealand in year 2008. Indeed been a while. 1st sushi that I've made today is kiwi salmon sashimi. The green kiwifruit slice needs to be thinner than fresh sashimi as I do not want it over-powering than the sashimi taste. Believe it or not, the crunch and the tangy fruity smell bring your taste to the next level incredibly. 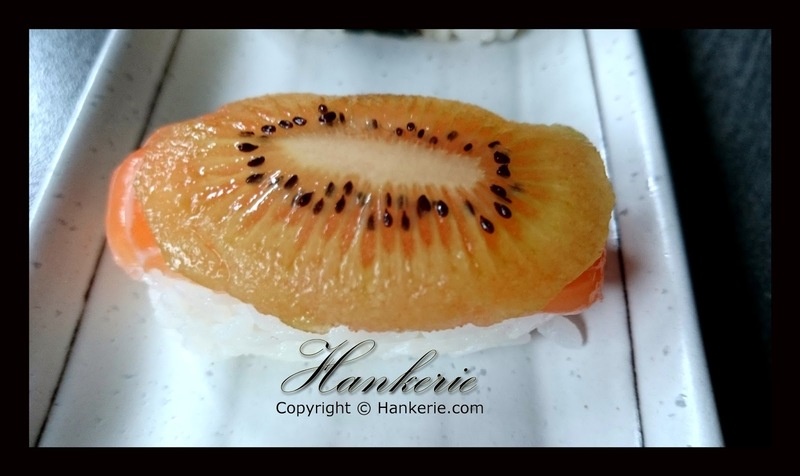 The 2nd sushi that I'm making is Tamago Yaki Kiwi Sushi Omelette, in how to make the omelette, I refer to this recipe. This relatively the sweetest sushi among these 3 types of sushi that I've made. 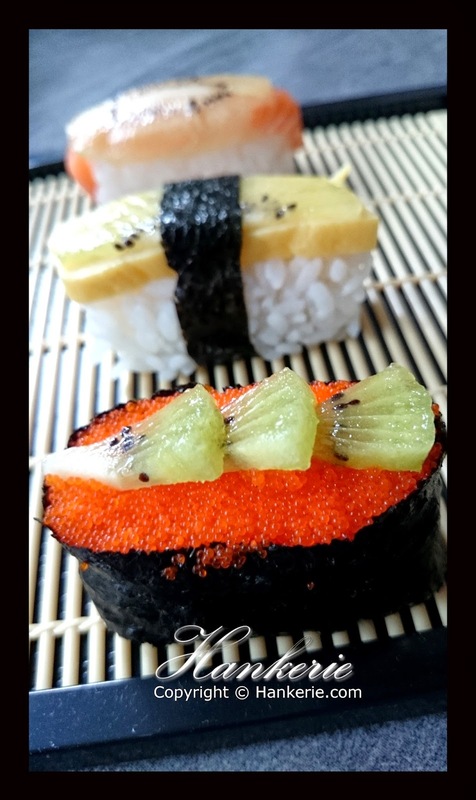 The 3rd sushi that I am going to make is Sushi Kiwi Tobiko. Tobiko is the tiny, orange, pearl-like stuff you find on sushi rolls. It's actually flying fish roe, which technically makes it a caviar (albeit less expensive than its sturgeon cousin). Tobiko adds crunchy texture and salty taste to the dish, not to mention artistic flair. In its natural state, however, it is not very flavorful. Hence, I've added 3 kiwifruits on top of it. Cook the Japanese rice in rice cooker. Add the rice to a wooden bowl, mix to help it cool down. When cool, gently add the vinegar mixture and mix to combine. Use the rice at room temperature. Place the rice onto the seaweed sheet, gently spread the rice evenly to each side; ensuring leave an inch gap on the side you are rolling towards, add fillings as you wish. Folding the bamboo mat (on the side closest to you); gently roll as tight as possible (if your seaweed is not sticking, dab the uncovered end with water). Decorate with green kiwifruit slice. All of our bakes are home-baked by using only the freshest ingredients. We have own creations and and decorate them by handmade with love and care. Feel free to contact us at hanker@hankerie.com for a detailed quote. Location only available at Sydney now. Aspiring pastry homebaker and cake artist. Foodie. Currently self-taught in baking. Learns through reading, experimentation and practice. "Baker, Blogger, Food writer, recipe developer & culinary enthusiast. From Passion to Profession"
Visit Hankerie MYS's profile on Pinterest. 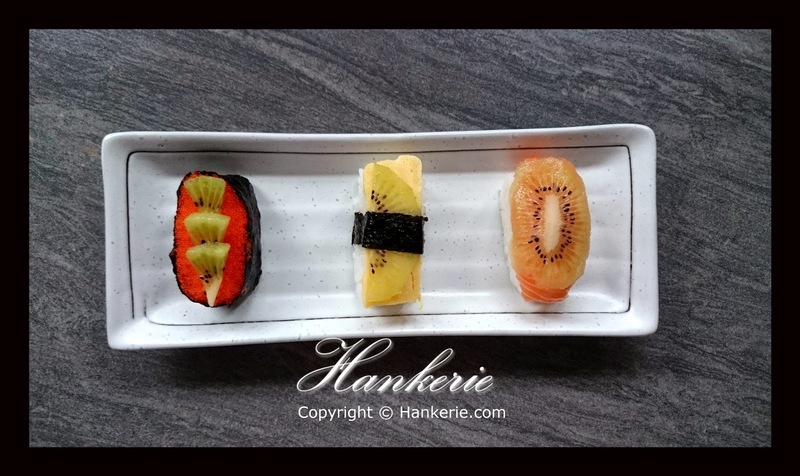 This work by Hankerie is licensed under Han Ker .